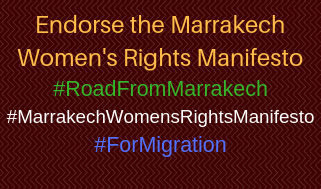 The Women & Global Migration Working Group has launched a platform for the rights of women in migration at the Peoples’ Global Action 2013 addressing the governments gathered for the United Nations High Level Dialogue this week. Please see flyer below and a pdf of the front is available here and the back is available here. The back of the poster has the WGMWG platform, so please be sure to print both sides!